Author: Wisniewski, David Set In . . . Description: "Grrr!" growl the cats. "Eeek!" squeak the mice. So it goes in the battle between cat and mouse. But when feline crime hits Tokyo, an unlikely hero strikes back. He's not lean and mean. He's round and profound. He's Sumo Mouse! And he's ready to wrestle all wrongdoers. But can this champion of justice squash the sinister schemes of Dr. Claw? Or will evil pin Sumo Mouse to the mat? 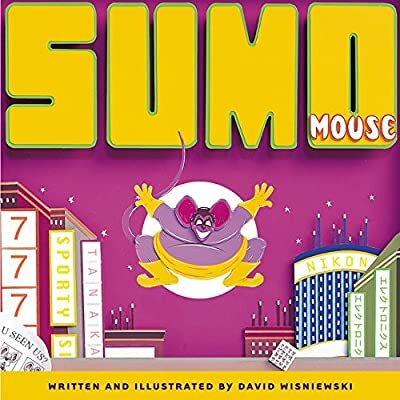 Caldecott-winning illustrator David Wisniewski has wrestled brightly colored papers into fun, comic book-inspired collages for this action-packed mouse tale.